In 1915, Mary Edith Radigan (standing, fifth from left) and classmates in the seventh-grade home economics class at St. James Elementary School, Bay City, pose near modern gas burners. The girls wear uniforms that include pinafores and various-style caps resembling those of nurses, nannies, or lab technicians. Their first cooking lesson was making mayonnaise. The photo was taken prior to America’s entry into World War I at the height of the Progressive Era, a period of rapid urbanization and industrialization. Management by scientific method had become important—and women’s status was changing rapidly. Home economics classes then taught scientific-type skills, including food preparation, nutrition, and food storage safety, and they also helped girls prepare for emerging career opportunities. 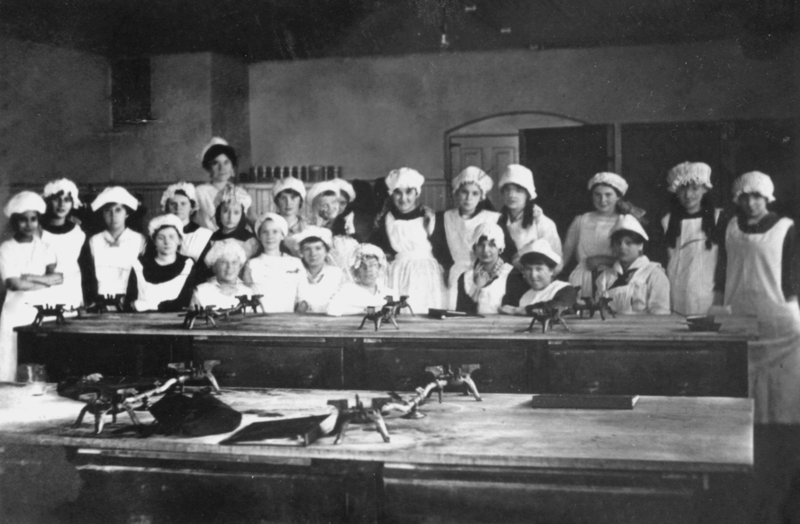 By the early 20th century, home economics was taught in elementary, middle, and high schools, and an increasing number of land-grant colleges started offering “domestic science” home economics programs at some campuses. This enabled women to study for professions in areas such as extension service, state and federal governments, industry, hospitals, restaurants, and hotels. “Home economics” classes declined in the late 1950s to early 1960s, as the teaching of health and hygiene principles popularized and as women’s economic and social roles changed. Departments and colleges changed “home economic” names and content in varying ways. The American Home Economic Association (est. 1909) was renamed the American Association of Family and Consumer Sciences in 1994. Photo courtesy of Janice Sass, Bay County.